Is the Herald’s Jerry Holbert Clipping the Globe’s Dan Wasserman? First off, let’s stipulate – as they say on Law & Order – that Boston is lucky to be not only a Two-Daily Town, but also a Two-Editorial-Cartoonist Town. And we have a couple of really good ones – Jerry Holbert at the Boston Herald and Dan Wasserman at the Boston Globe. Both of whom, as the hardreading staff noted recently, have waded into the Anthony Weiner rumpus down in the Big Town. 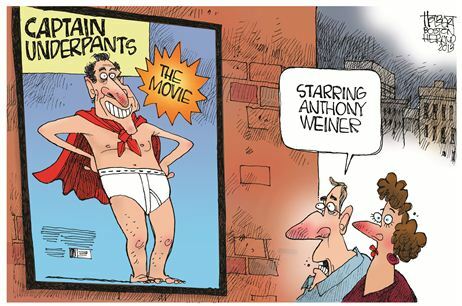 In Thursday’s editions, the two coincidentally visited Six Flags Over Anthony Weiner. To be clear: We’re not accusing anyone of anything. This entry was posted on Tuesday, August 13th, 2013 at 2:14 pm and is filed under Uncategorized. You can follow any responses to this entry through the RSS 2.0 feed. You can leave a response, or trackback from your own site. 3 Responses to Is the Herald’s Jerry Holbert Clipping the Globe’s Dan Wasserman? http://en.wikipedia.org/wiki/Captain_Underpants – It’s a real thing. Who knew?